Finnix is freely distributable under the terms of the GNU General Public License. For more information, please see Legal. Previous releases, system requirements and more information are available on the Downloads page. Full news posts are available at the Finnix blog. To your left, you will notice a menu of major sections of the Finnix site. This sidebar is available on every page, but to get you started, here is a description of each major section. Download the latest version of Finnix. Release announcements are available in the announcements category of the Finnix blog. Screenshots are available for many Finnix releases. Need help? Known issues and general support is available on this page. Finnix is available for several platforms, including x86, PowerPC, User Mode Linux, and Xen. Finnix has a long and colorful project history. 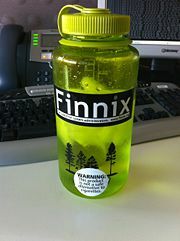 Finnix.org is powered by MediaWiki software. Some pages (such as this one) are protected against vandalism, but many (mostly under the Help section) are freely-editable. Users are encouraged to add as much relevant information as they can to help other users with Finnix. Please browse through the MediaWiki User's Guide, then simply click "Edit" on a page. This page was last edited on 16 February 2019, at 23:47.